It's not a country. It's not a state. The residents speak Spanish and have their own culture, but are also American citizens. What gives it? It's a question comedian Elizardi Castro tackles the head of "Made in Puerto Rico", an off-Broadway show that runs at New York's Puerto Ricas Traveling Theater. Although Castro developed one man's show more a decade ago, it has never been more relevant. Earlier this month, President Donald Trump on Twitter complained that all police politicians are "complaining and asking for more money" to rebuild after Hurricane Maria, who destroyed the island in 2017. Trump called the politicians "grossly incompetent" said they "use the money badly or corruptly and only take from the United States." Trump's comments came in between a bitter sweep with the Portuguese officials over disaster relief efforts. The week before, Puerto Rico said Gov. Ricardo Rosselló that he would "turn bully into his mouth." 1; not once, but twice. He later said that the error was just a slipping of the tongue. In fact, Puerto Rico is not a country or a state. It is a commonwealth governed by the US government. Puerto Ricans holds US citizenship, votes in the President's primary election (not elections) and travels freely between the island and mainland America. As such, Puerto Rican's Americans – not immigrants. But they also maintain a strong cultural identity. It is this unique experience that Castro, 46, shares with the audience in his show. "Made in Puerto Rico" started sharing some of the stories of growing up in Puerto Rico that I missed, but also growing up in the United States, "says Castro." We live in both worlds … We expresses us in both languages. " " We are Portuguese, but we are also American, but we sometimes feel that we are & nd de aquí, nine of all & # 39;. ("Neither from here or there"), "he added. 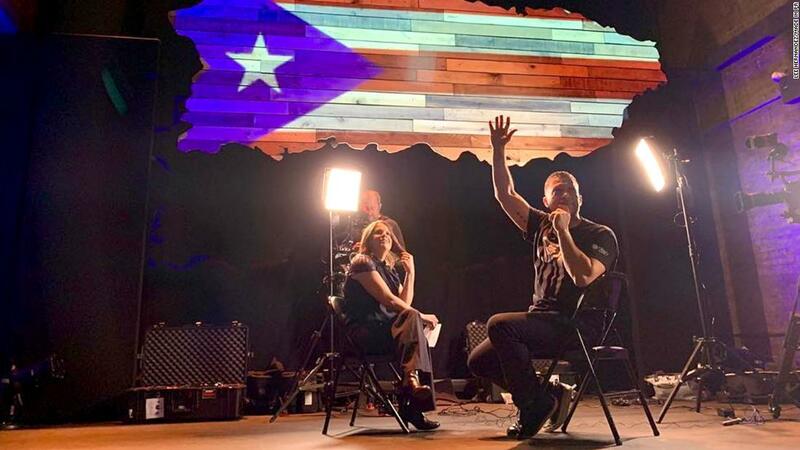 <img alt =" Comedian Elizardi Castro sits with CNN's Maria Santana to talk about his off-Broadway production "Made in Puerto Rico." Castro moved from Puerto Rico to White Plains, New York, in age 9 years. As he says, the transition was both difficult and fun. Among the many stories he shares with the audience is how he learned to eat American food (believe me, you will never eat a hot dog the same way again) and the pain of listening to 80's punk rock instead of Puerto Rico band menudo. "In Puerto Rico, we have a strong sense of cultural pride and it is not like the United States. When we come here, we can be legal citizens, but it is as far as it goes," Castro said. "It's not an easy transition. The language is very strong. Our sense of music and style is very different. It's a culture clash." Castro is aware of political controversies that have drawn Puerto Rico to recent headlines. But say he prefers to keep politics out of his show. In fact, Trump is not mentioned once. The goal says he is to help others, especially on the mainland, understand and identify with what it is like to be Puerto Rican. "I wanted to create a space to celebrate our culture," he says. "Where people can come and see that it's OK to feel different and say," It's great to be Puerto Rican, it's great to be latino. "" "It doesn't have to be offensive. You can be proud of being from wherever you are, without lowering yourself so others can feel more comfortable." So far, the audience has flocked to the message. "Made in Puerto Rico" should run through March, but has extended its stay at the Puerto Rican Traveling Theater until April 21 and is sold out. Castro says he hopes one day to take the show to Broadway so he can reach an even bigger audience.